Comes complete with professional 1.5" Manila Rope and 2 orange cones for center markers. Never use any type of rope other than natural manila Manila tug of war rope is the only type allowed by the Tug of War International Federation (TWIF), which organizes and establishes the rules for world championship games. The TWIF rules for international competition say the rope should be from 10 to 12.5 centimeters in circumference (about 1 1/2" diameter), at least 33.5 meters (about 110 feet) long (there are eight pullers on each team), and have plain whipped ends. Loops, knots, or other holdings are not allowed - and wrapping the rope around the hands or any other part of the body is considered creating a "loop" (there's an exception for the anchor, or end puller, but even then the wrap is not tied, spliced, or otherwise locked - so it can be released quickly). It makes sense to vary from certain parts of these specifications for games at picnics or children's birthday parties. The diameter can't be reduced for small hands, and the length can be adjusted based on the size and number of participants and space available. Whether working with children or adults, game organizers should take the time to go over safety concerns with the participants. Never make a loop by wrapping the rope around the hand to get a better grip.
. Especially, but not exclusively, when using a tug of war rope with a smooth or slippery surface, there is a temptation to wrap it around ones hand to get a better grip. In addition to being against the rules, which state the rope should be held using a natural grip, with both palms facing upward and the fingers wrapped around the rope, looping the rope around ones hand is extremely dangerous. Imagine being dragged along the ground because you can't release the rope. 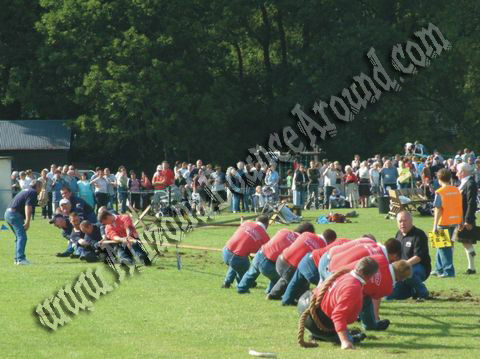 The tug a war rope rental price includes standard set up if it is being delivered with a inflatable(s). 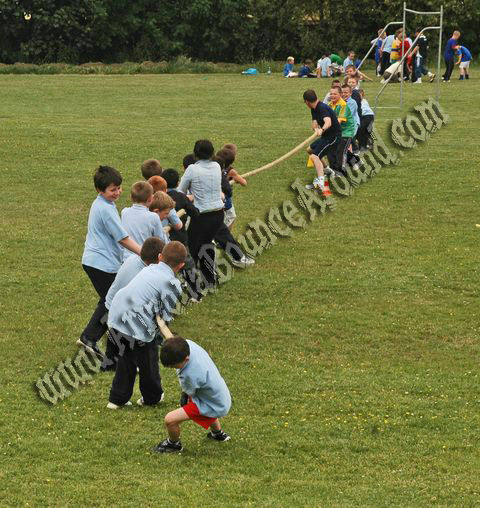 If you are renting the tug of war only than delivery and pick up are not included in the rental price. Standard setup is delivery and removal within included delivery area with no restrictions for delivery, set up or pickup. We do not allow the tug a war rope to be used on dirt but it can be used on sand, grass, asphalt, concrete, indoors or on artificial grass.